LIKE NEW courtyard home with its own heated pool & spa lives like a single family home but with the convenience of condo maintenance. Interior Features Totally redone in 2011 to the highest standard, this courtyard home with a first floor master suite has it all. Open floorplan with living, dining, family room adjoining the beautiful kitchen on the first floor. Two guest suites, each with its own full bath, are upstairs. Kitchen has Silestone counters, 43" wood cabinets, stainless appliances and a casual eating area. Exterior Features The courtyard provides wonderful exterior living area and is totally screened for easy maintenance. A cabana with full bath and mini-kitchen is accessed off the courtyard. Truly flexible, it is Ideal for an office, mother-in-law or teenager suite or hobby/art studio. Pool and spa are perefect for private relaxing and if you really want to swim laps or join the pool aerobics then the clubhouse pool is nearby. Additional Features and Amenities BEAUTIFULLY FURNISHED and can be purchased turnkey ready. Start enjoying the Florida lifestyle from day one! 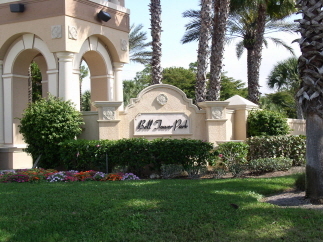 Bell Tower Park is a premier gated community in south Ft. Myers with easy access to beaches, shopping, restaurants, airport and its own terrific community amenities. Two car garage and your two pets are welcome here.